At Struto, we talk a lot about our favourite marketing tool, HubSpot. That's because we believe in the software. We regularly dive into its features and performance capabilities as an all-inclusive marketing and sales platform. But, what about the other marketing and sales tools out there? 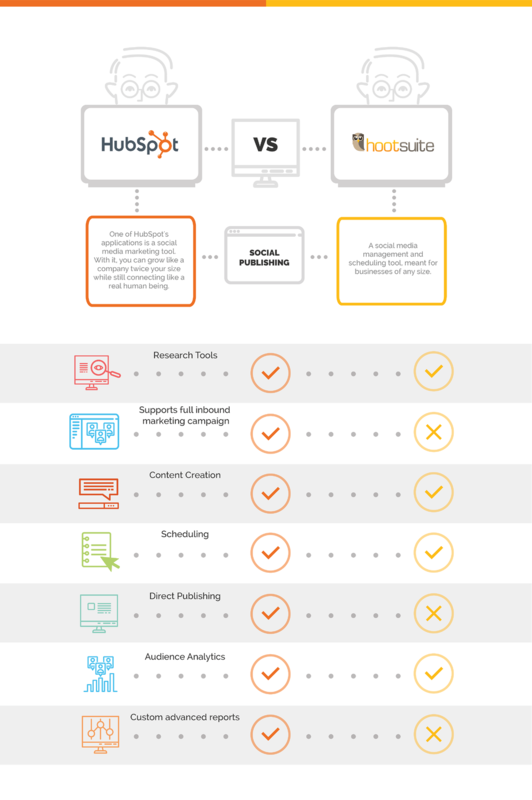 What if we compared HubSpot against some of its top competitors? 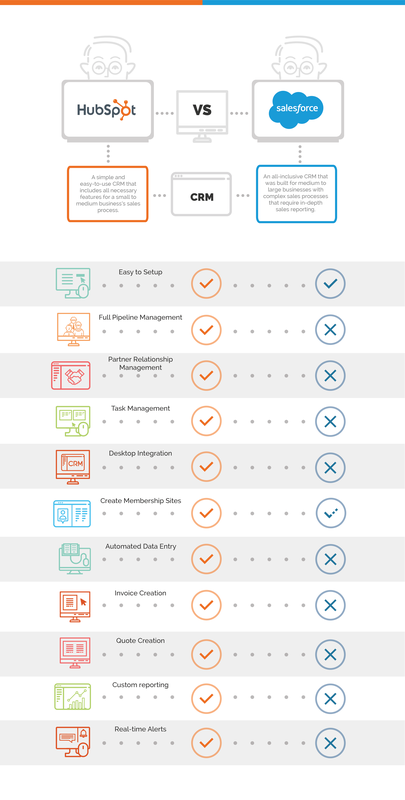 In this infographic, various aspects of HubSpot’s software are put up against the offerings of its competitors, like WordPress, Marketo, Hootsuite, SalesForce, and MailChimp. 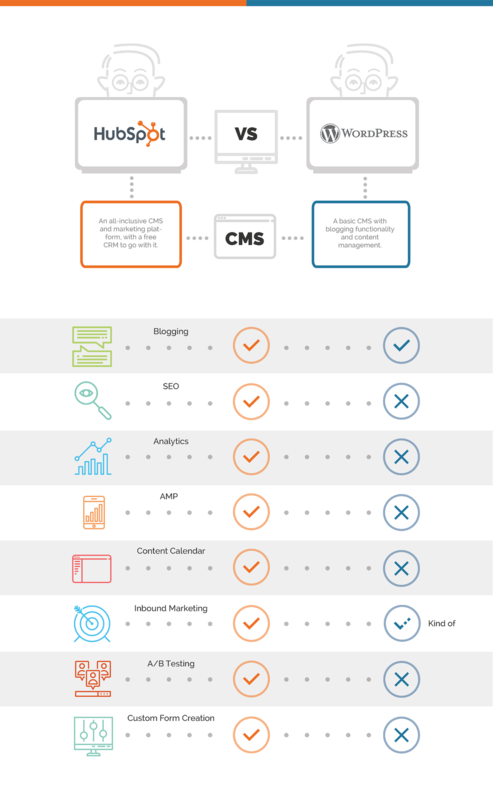 We compare a variety of tools, such as content management system (CMS) features, marketing automation features, social media management, customer relationship management (CRM), and email marketing capabilities. But that's the clincher that we hold to in the end. All of these competitors only offer one or two aspects of HubSpot's software, because, unlike its competitors, HubSpot was built to support a full inbound strategy end-to-end. The most obvious difference between HubSpot and WordPress is that HubSpot was built to support a full inbound strategy, whereas WordPress grew from a blogging platform into a wider content management system (CMS). While WordPress has some inbound support because of its blogging and content creation tools, it does little to compare against HubSpot. 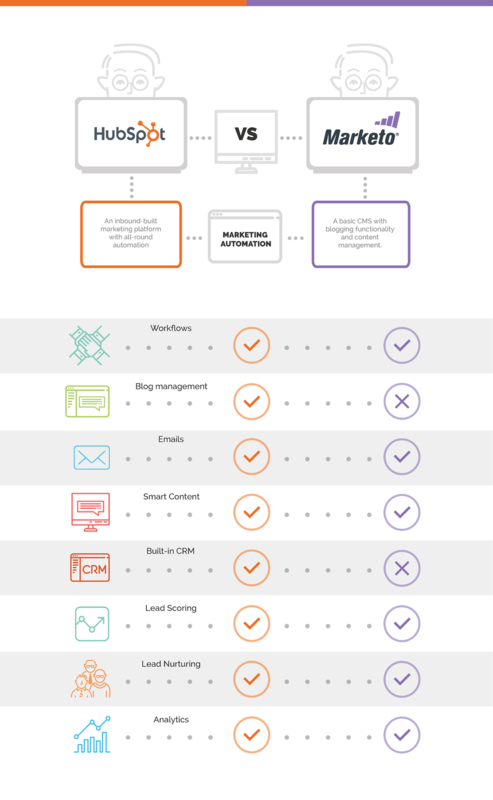 HubSpot supports full-funnel inbound marketing, with lead nurturing and scoring tools included. WordPress, on the other hand, needs multiple plug-ins to truly implement an inbound campaign and compete with HubSpot (only really offering blog and website content creation). Most of the features that WordPress doesn't natively support have available plug-ins, but it does mean working with a wide software stack. HubSpot includes these features natively, like a built-in analytics dashboard and the optional extra of custom reporting. One of the biggest differences between HubSpot and Marketo is that HubSpot includes a built-in customer relationship management (CRM) tool. This helps drive synergy between sales and marketing, but it also aids your analytics and reporting, by having all your information in one place. While both HubSpot and Marketo offer powerful analytical tools, they do differ. Marketo’s analytics is far more technical and provides a deeper analysis meant for strategic visibility. However, HubSpot’s strength is in having a business’s information in a central location, and offering its marketing platform alongside a CRM and sales dashboard. This means that, with HubSpot you can compare marketing and sales analytics, compile cross-team reports, and foster more collaboration between sales and marketing within your company. This is a tough comparison because the two tools don’t exactly stand up against each other. HubSpot does everything that Hootsuite does, but it includes other tools to support a full inbound marketing strategy and even a free CRM. If you’re only looking to manage your social media, then Hootsuite is probably the best option for you. But, if you’re looking to manage your social media in collaboration with the rest of your marketing and sales efforts, then HubSpot is undoubtedly the right tool for you. HubSpot has incorporated some helpful functions into its CRM that it’s adapted from its marketing platform, such as automated data entry and lead management. But, SalesForce certainly has a more detailed and in-depth CRM tool. Which tool you decide to use will be based on the complexity of your sales process (of which complex ones will likely need SalesForce to support them), but also on how you want your marketing and sales teams to work together. As HubSpot offers their CRM in the same software stack as their marketing platform, your teams can work together to achieve shared goals. This is the unique selling point of HubSpot. SalesForce was built for sales teams specifically, and while it can integrate with marketing software, it can’t ever share the unity that HubSpot has. Like I said, we believe in HubSpot at Struto. But, we definitely think you should be able to make an educated decision as to which software you invest in. In most cases, we've found that HubSpot comes out on top. It’s most unique strength is that it can do all of the above in a single software solution. This makes reporting so much easier, allowing you to access data from marketing or sales in one tool, meaning that your management is much easier too. While other software certainly have their own strengths and unique features, HubSpot stands above the rest as a truly integrated marketing and sales machine.